Click on the [+/-] below to reveal the questions and answers. Evaluations may be requested by surgeons themselves, hospitals, or licensing bodies. Although the program is intended to evaluate the aging surgeon, there is no specific age limit. 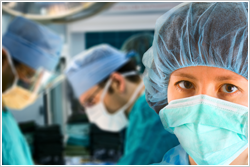 Surgeons of any sub-specialty are candidates. Exclusions include substance abuse and known psychiatric illness. The surgeon must understand and speak English. We are testing general health, eyesight, neurocognitive faculties, visual-spatial and fine motor capability. We are not testing medical knowledge, specific surgical skills, or medical interviewing and documentation skills. Since our evaluation is objective, unbiased, and based upon the best evidence extant, you must sign an “indemnification document” that protects us if there are subsequent consequences of our report. Also, no doctor-patient relationship is established, as this is more like an independent medical evaluation of a client. We will request permission to contact a significant other and, in the event that a serious issue is discovered, your personal physician. Some disorders that, if treated, might improve a surgeons capabilities include medication side effects, depression, neurologic disease (i.e., hydrocephalus), sleep apnea, vision problems. Disorders that could affect a surgeon’s ability to practice include dementia, other cognitive impairment, neurologic disease, significant tremor. If we discover a disorder which is an immediate safety concern to you or others, we will contact, with your prior permission, your personal physician and/or significant other. The individual or institution who pays for the evaluation will receive the final report. The report will be kept on an encrypted drive and provided in the form of a locked pdf file. We consider confidentiality an absolutely crucial component of the program. The chance of reporting a problem that does not exist is extremely low. The range of ‘normal’ in nearly every test is based on the general population. Surgeons tend to perform better than the general population, so an abnormal finding is truly abnormal. No. The report will relate only the objective results of the comprehensive evaluation. A surgeon and/or hospital may use the results to make decisions regarding privileges, lifestyle changes, treatment, etc. We will provide the report within two weeks. No preliminary results will be given unless an urgent problem is found. The surgeon is responsible for his or her travel, hotel (special rate available at our nearest hotel), breakfasts, and dinners. A one-time all-inclusive fee, paid in advance, will cover the two-day comprehensive evaluation and report. This fee is presently being calculated. You may contact us for the amount of this fee. Lunch will be provided each of the two days. Breakfasts and dinners are the responsibility of the surgeon. Baltimore offers many opportunities for excellent meals. There is a convenient shuttle from the Radission Cross Keys Hotel and back. If a surgeon drives a personal car, we will provide a parking pass each day. Comfortable clothes are appropriate. You will not be judged in any way based on your dress. Shoes with heels are discouraged. Room temperatures will be comfortable but an additional layer of clothing such as a sweater may give you more flexibility. The tests are not physically stressful, though the day is long. Accommodations such as eyeglasses, hearing aids, and braces should be worn. Cell-phones and pagers must be turned off during the tests but may be used during the lunch breaks. The greatest cost of the program is clinician time, particularly the neuropsychology component. Some sophisticated equipment is employed in the Physical/Occupational Medicine area. Please feel free to contact our Clinical Coordinator, JoAnn Coleman, DNP, ACNP, AOCN at 410-601-5719, jocolema@lifebridgehealth.org.